It’s been a little while since I’ve raced a half marathon – June actually with an overcast coolish summer day. 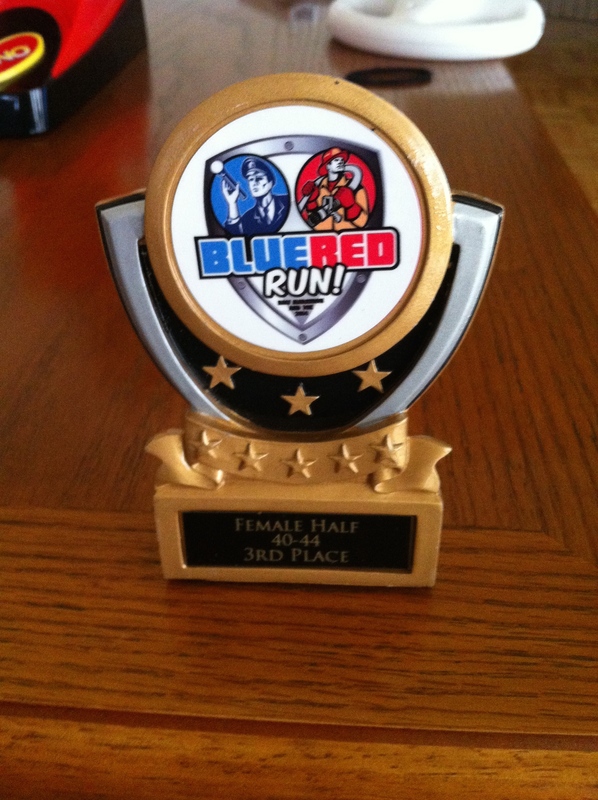 After that race, I got a registration discount to sign up for the inaugural Blue Red Run. 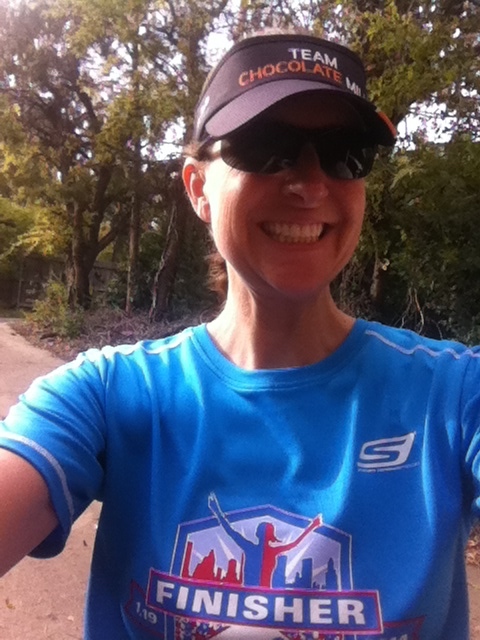 The timing (4 weeks) before the Dallas Marathon seemed to be a good fit to test my goals. Like most of the country, North Texas was hit with a nice early cold snap. I kept my early morning runs outdoors except for the day when the wind chill felt like 15 degrees. I know my immune system is being tested with the higher mileage right now, and I didn’t want to push my limits any more than necessary. So I did my easy run on the treadmill that day and finished dripping in sweat. 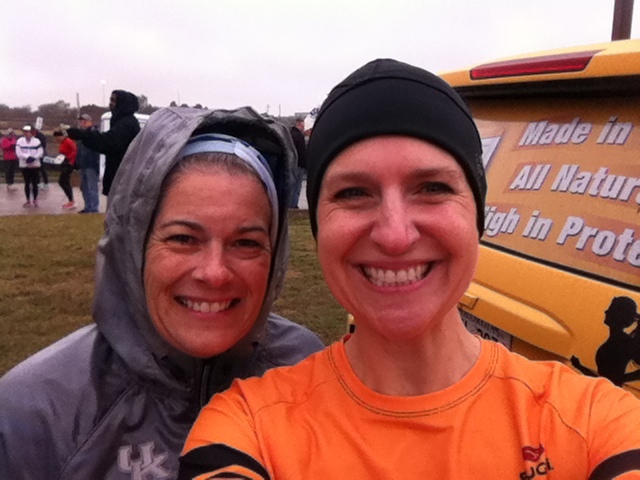 Race day was cold and damp. There was a light drizzle that continued for the entire race. I was prepared with my new Target C9 hat. 37 degrees and rainy? No problem! It may not be the cutest, but I’m cheap, it was on sale, and it kept my head dry. If it had been colder or heavier wind, I would have gone with a fleece headband. My head doesn’t usually get too cold, but I like to keep cold wind out of my ears. Kudos to the guy around mile 4 who said to me “It’s beautiful out here.” At first I thought he said “flat hair” so you can see where my mind was. Ha! Seriously though, it was a great course, mostly paved and through a park. Nice for being in the middle of a city. 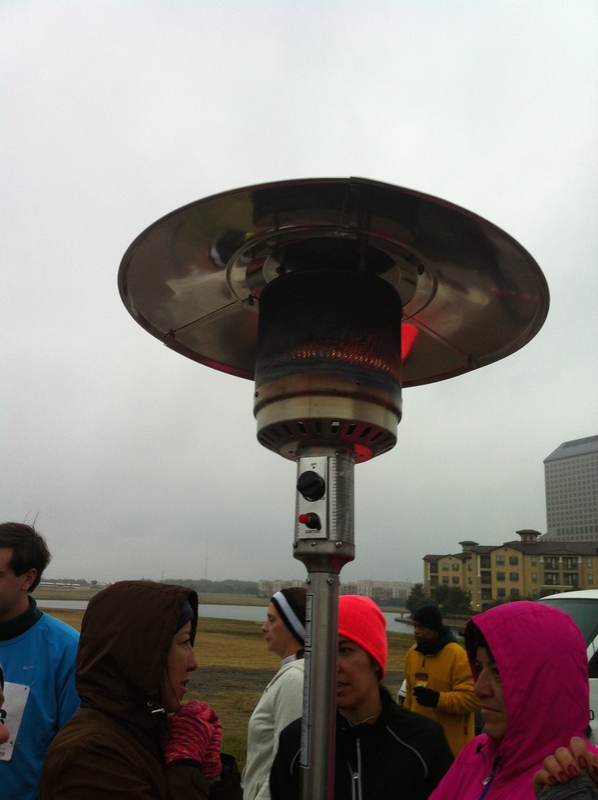 Three cheers for outdoor heaters! My goal was to break 1:50:00 which would give me a nice new PR and big boost of confidence. My pace needed to be 8:23. I planned to negative split and follow my usual plan of running 5 miles at one pace, dropping down for the next five, and knocking out the last 5k at a faster pace. This plan worked, with one minor exception. 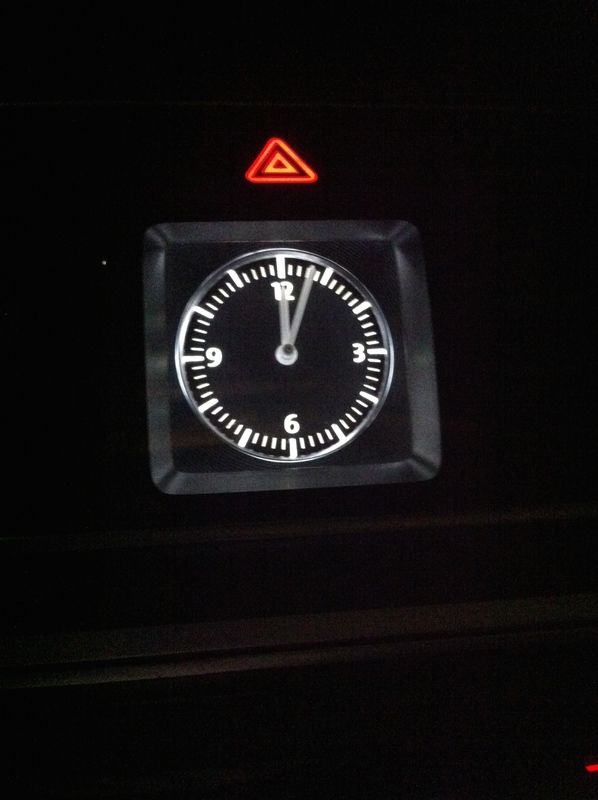 I forgot to account for GPS difference. Miles 1-5 averaged 8:28, 6-10 were at 8:20, mile 11 in 8:22, 12 in 8:35, and the last one was 8:19 for an overall pace of 8:24 for 13.19 miles on the Garmin. My official chip time was 1:50:47 (8:27 pace). I started to feel strong around mile four, but by 9 I was starting to hurt some. It became harder to hold my pace. I took a GU at miles 4, 8, and 11. Mile 12 was my problem though. We went up a hill and straight into the wind. Unfortunately I run like I drive – away from the pack – so there was no drafting. I turned my face downward since the rain had picked up a little, and pushed through. Then a turn and a small downhill took me to the finish. Parking was close and I was wet and cold, so I headed straight to the car after I finished to get my jacket and chocolate milk. I had a guy stop me and say, “Hey, you were fast. I was trying to catch you!” I said thank you through my half-frozen lips. At this point, I still thought I had set a PR. 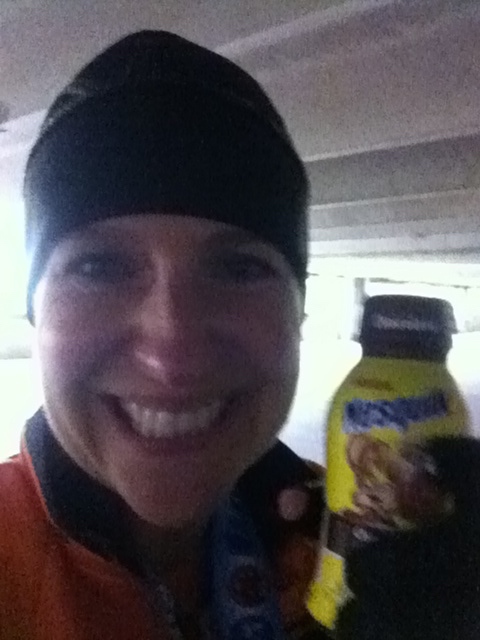 I started my recovery with chocolate milk (I love that carb to protein ratio) and headed back to the finish area. It wasn’t until I checked my time at the result tent that I realized I had missed my PR by five seconds. I’m not going to lie. I was upset with myself. Darn that mile 12 where I lost 10 seconds. My friend found me after she finished. She went to check her results while I was waiting for pancakes. When she came back, she told me she set a PR by one second after being sick all week. Awesome! 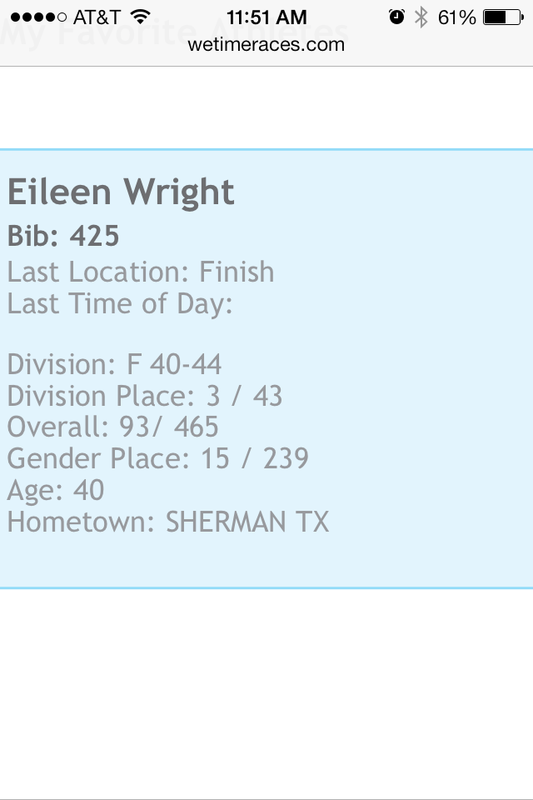 Oh, and I was third in my age group. What?!? This was my first age group place in a half marathon, and I still can’t believe it. Instead of enjoying that little victory for what it was, I spent the afternoon second guessing myself and my goals. I feel like I’ve plateaued and am not getting faster at the shorter distances. It wasn’t until I looked at the official results on Monday that my perspective straightened out. For a high school girl who was lapped in the 3200 meters on the track, I’d say I’ve made some progress. Of course it’s not always about my time or age group place, but for me to know that I pushed myself to do the best I could at that moment. I can look back at this race with no regrets. Maybe a drier day would’ve been different…but it’s time to move on. I’ve got a marathon in less than four weeks. My goal may still seem way out there, but I’m not going to change anything with my training. I’m just going to keep on moving. In the past couple of weeks, I have made some changes. These changes are eliminating stress in my life and make training more manageable. With just over a month to go until the Dallas Marathon, I need to keep a positive focus and up my mental game. The first thing I did was cut our grocery budget. We can spend a ridiculous amount of money on food. We like to eat, and we enjoy going out as a family. It’s one of the ways we spend time together. But I find it hard to make healthy choices at a restaurant. Especially if we go to On The Border. Free chips and salsa. Yes, please. “Would you like me to bring out some more chips?” Sure. Or Italian food. Bread. Bread. Bread. Mmmmmm. I finally hit a point where I got fed up with myself. I told my husband we needed to stop eating out. I was overeating and it was affecting my training. Done. We haven’t gone out in three weeks. Step two was to do a better job of having food to eat at home. After all, most of the time when we went out, it was because of my poor planning with nothing to make for dinner. So for the last three weeks, I have made a trip to the grocery store on Saturday afternoon with a meal plan and a list. The meals aren’t fancy. This is me we’re talking about. Chicken enchiladas, quesadillas, and layered pasta are just a few of the meals we’ve rotated. I plan to make another round for week four and then start over with week one again. My crock pot has been incredibly handy. One Monday, I threw a package of chicken breasts in the crock pot. I shredded them when I came home from work, and we had enchiladas that night and chicken quesadillas the next. A day later it was chicken and rice. Yes I know, very creative, right? But my stress level in the kitchen has dropped immensely. 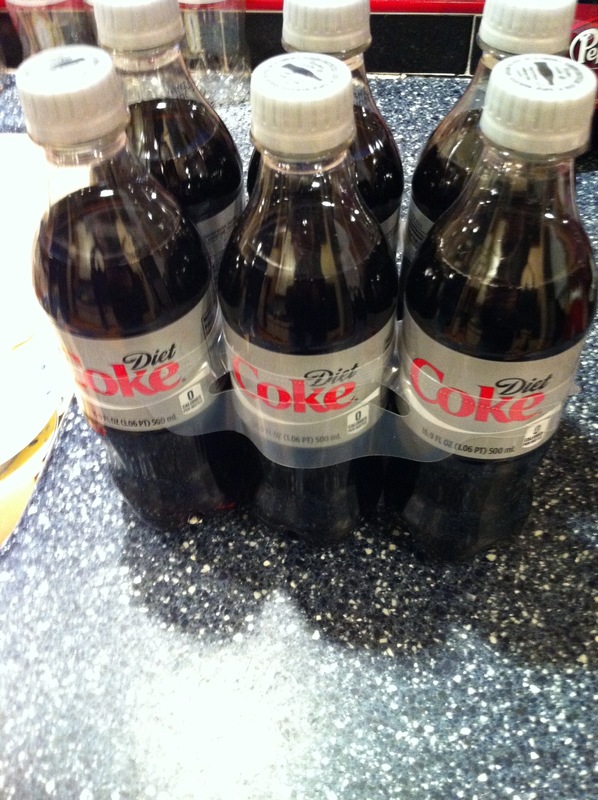 Step three: I haven’t had a Diet Coke in over two weeks. This is an old picture. Promise. This was a huge cut! One that I’ve tried to do at least ten times in the last six years. I switched to tea – mostly green – so I didn’t cut caffeine. I would like to say I feel great without diet soda in my system, but I haven’t really picked up on that yet. But, hey, I’m saving on the grocery budget too. Double whammy. 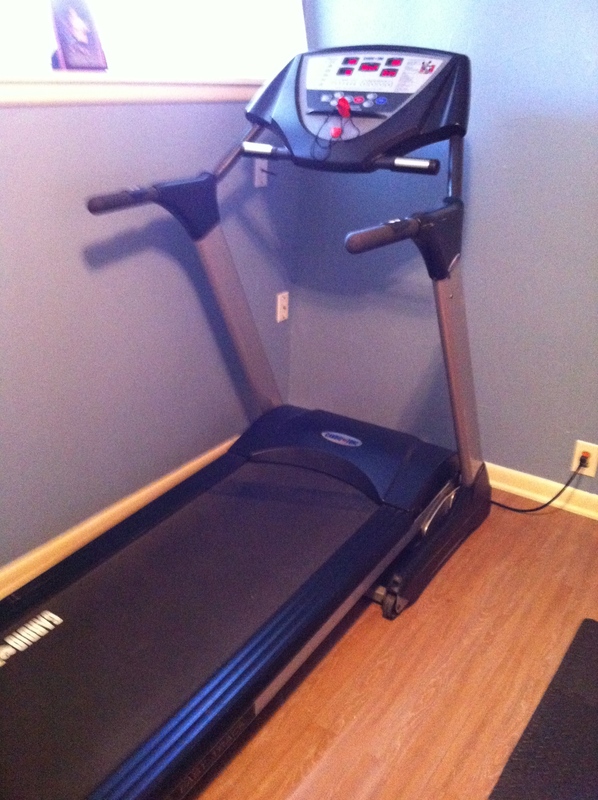 I had my first run on the treadmill last week. I did not enjoy it. It has been over four years since I ran on one, and it was hard. I don’t know why I thought it would be easier doing my easy pace on the treadmill. I was slinging sweat everywhere. Oh, well at least it’s there for the next ice storm. I’m ready for this year’s Icepocalypse! Friday night, marching season ended with the last football game. 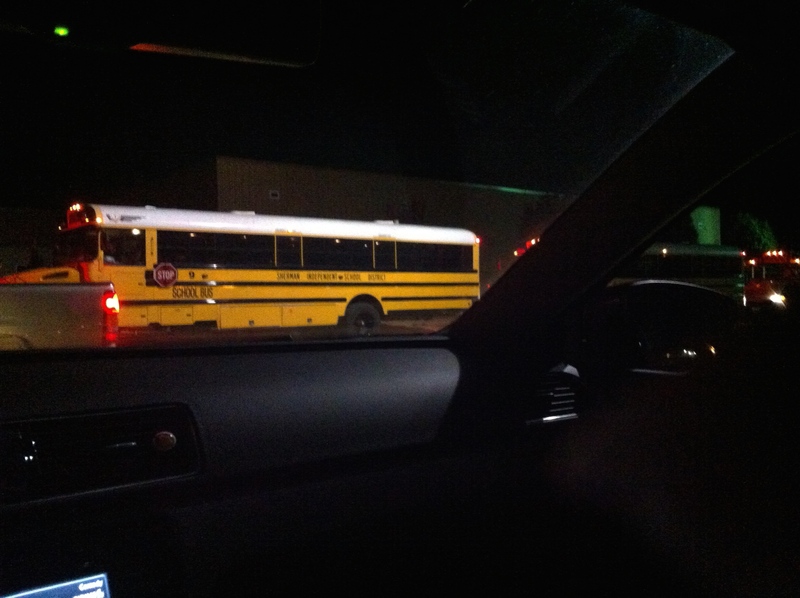 No more late night pickups at the high school after an away game. I get my early Friday night bedtimes back. Yay! This is my favorite part of fall marathon training – knowing I will get some sleep on the weekends. I do feel like I build up mental toughness doing long runs when I’m tired. On Saturday, I ran my second 16 miler of this training cycle. 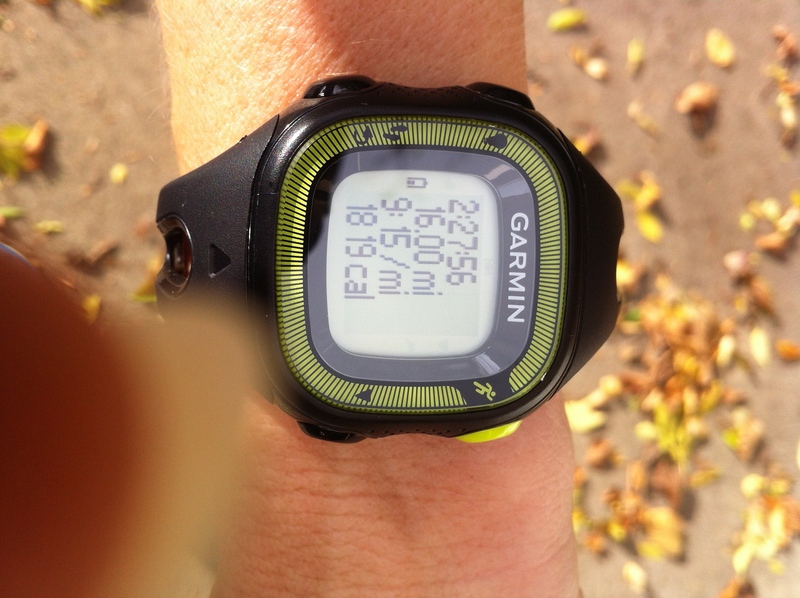 It helped to run with a few fast group members that pushed me in the early miles before the wind kicked in. Then on Sunday I finished off my highest mileage week since this time last year. I’m feeling good and strong. I don’t feel like I’m overtraining – just hungry. I actually lost a couple of pounds in the last few weeks. Now I just need to work on getting more rest. This Sunday, I’ll race a half marathon and test out my training. 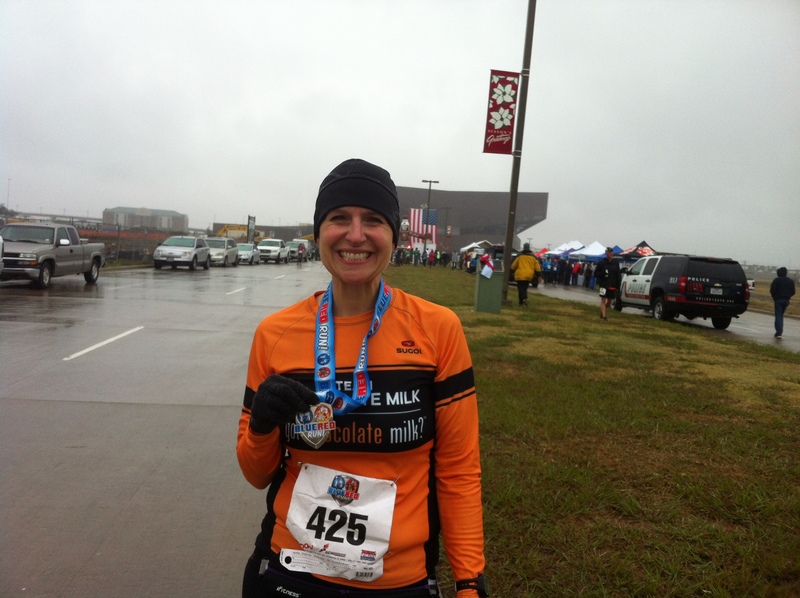 After that race, I’ll decide how to pace my marathon -which is just four short weeks later! What is one way you’ve eliminated some stress while training?